The importance of educational programs in the prevention and control of DM is well recognized. However, these programs do not appear to achieve the desired goal of increasing awareness of DM in developing countries. There are several reports emphasizing the awareness of DM in the general population to be low both in the urban and rural community. ,,, Hospital-based studies are scanty. The state of Kerala ranks first in the literacy rate, and doctor population ratio compared to other states in India with the comparable availability of specialized hospital care in the urban and rural areas. However, very few studies have been done in Kerala. This study was undertaken to assess the level of understanding of DM among patients attending the ophthalmology outpatient department (OPD) of a tertiary care unit in Northern Kerala. An attempt was made to ascertain the role of age, gender, educational status, living style and the disease history with this awareness. Further the study also intended to analyze the knowledge regarding the disease complications, treatment, and preventive strategies. A questionnaire based descriptive cross-sectional study was adopted for this investigation. The study group included both patients with diabetes and bystanders. The criteria for inclusion in the study were cases of DM with history of diabetes of more than 1 year, history of medical visits to a physician at least once in 3 months (so as to ensure a minimum of 4 visits to the physician) for diabetic care and first-degree relative bystanders of such cases who have accompanied the subject in at-least 50% medical follow-up visits for diabetic care. The sample size was more than the minimum required for statistical analysis (88) satisfying the formula 4pq/d 2 , where P = 57.6%, q = 100 − p and d = 20% of p (95% confidence interval). The study period was 6 months. The study was briefly explained to the subjects who met the criteria for the study. Those who agreed to participate were requested to provide consent on a consent form. There was no additional financial burden for the patient to participate in the study. A two-page questionnaire was administered to the study participants. The questionnaire contained questions pertaining to the participant's demographic characteristics and awareness of DM including general knowledge, causes, complications, management and prevention of DM. To those who could not understand or read English, the questionnaire was interpreted in local languages, by trained staff. Data were analyzed using SPSS version 17.0, Chicago, SPSS Inc. The effect of variables (such as age, education, place of residence, gender, and coexistent co-morbidities) on awareness of DM was analyzed. The awareness of DM was defined in terms of knowledge about the definition, causes, complications, management and prevention of the disease. The Chi-square test was used for univariate analysis. P < 0.05 was considered as statistically significant. The study group included 40 cases of DM and 50 bystanders of diabetic patients. The mean age of the study population was 49.78 years (range: 19-78). There were 48 females (53.33%). 93.22% (n = 83) of the participants were married. 74.6% were residing in urban areas (n = 67). 29 subjects (32%) were having a sedentary life. The rest had a nonsedentary occupation such as farming, manual labor, masonry, and carpentry. 45.83% (n = 22) of the females and 92.85% (n = 39) of the males were leading a nonsedentary life. 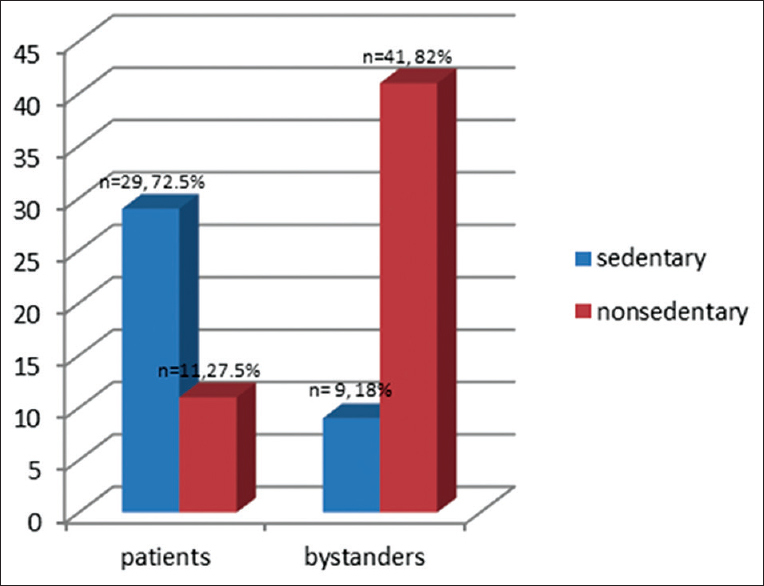 Among the bystander group 32% (n = 16) were diabetic and 81.25% (n = 41) were leading a nonsedentary life [Figure 1] and [Figure 2]. The average number of visits to the physician was 6.8 (standard deviation 3.14) per year. Prevalence of diabetes in more than one family member other than the participants and their related bystanders were noted among 52.22% (n = 47). Among those with such a positive family history, the participants had a sibling (24.8%), mother (19.6%), father (22.4%), or grandparents (4.3%) in the family who were diabetic. Among the study population, 54.71% had been diabetic for a period between 1 and 5 years. 7.54% (n = 4) were diabetic for 10 years or more. Of the 90 participants, who were aware of their condition, only 38.70% (n = 43) said they knew what DM is. However, 83.72% of the study participants who claimed to know about the disease had no knowledge of the causes of DM except that it is caused by high sugar intake. 65.55% (n = 59) of the participants said the condition runs in the family. 51.9% of males and 54.8% of females were aware of diabetes. Sixty-five subjects (72.22%) were aware of visible complications of DM. Out of this 38.41% (n = 25) knew about defective vision due to retinopathy; 55.38% (n = 36) knew about delayed wound healing resulting in amputations and 44.61% (n = 29) knew about increased risk for infections. The awareness of the invisible complications of DM was comparatively lower [Table 1]. Among the participants, 14 cases knew that DM can lead to kidney failure (21.53%). None was aware of the direct association of diabetes with other macrovascular complication like cerebral vascular accident and coronary artery disease. Seventy-one subjects knew that diabetes can affect the eyes. 39 participants related defective vision in diabetes to cataract alone while 7 cases knew about recurrent style. Twenty percentage (n = 18) said that the eye is not involved directly in diabetes. One person did not respond to the question. Those with retinopathy felt that all diabetics should have eye checkup but were not sure about the regularity or schedule. Regarding the management of DM, 53.33% (n = 49) were aware of oral hypoglycemic agents (OHA) and insulin as the treatment options for diabetes. 31.11% (n = 28) felt dietary modification and medications could control diabetes [Figure 3]. 7.78% (n = 7) said that dietary modification is the mainstream of diabetic management. 82.22% subjects knew that regular blood checkup was required for screening and follow-up. 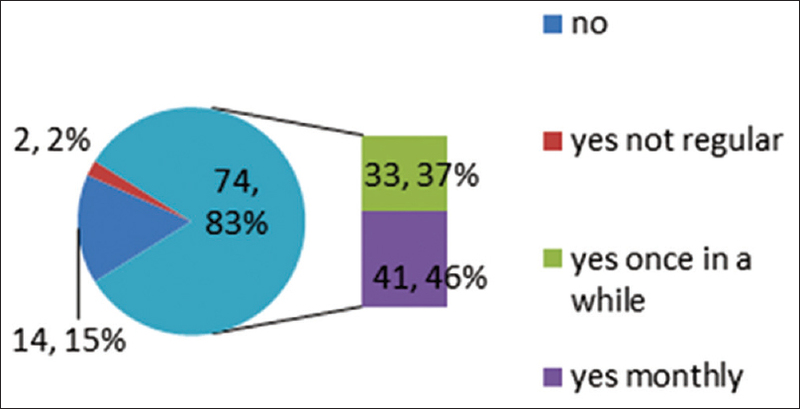 But, only 81.33% (n = 41) of them said that the checkup has to be done monthly [Figure 4]. Knowledge about the preventive measures was noted as follows; all the subjects were aware of avoiding sugar and jaggery in the diet, but only 12.23% (n = 11) knew about the various other food items to be avoided by a diabetic. 53.33% (n = 57) understood the need for exercise in diabetic control. However 56.11% (n = 32) thought of their work as sufficient exercise. Only 22.80% (n = 13) exercised regularly at home. The source of information was the treating physician in 41.11% (n = 37), periodicals and magazines in 13.33% (n = 12), relatives and neighbors in 1% (n = 9) and mixed in 12.22% (n = 11). 15.55% (n = 14) said they were not informed in detail about the disease while 1% (n = 9) were not sure about the same. 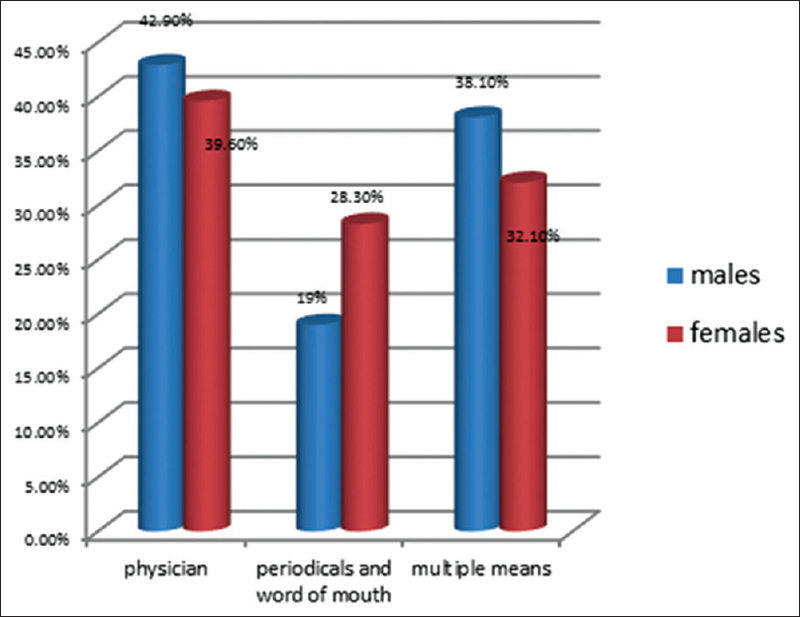 Among males, 42.9% owed their knowledge to treating physician and 19% to periodicals and word of mouth. Among females, these percentages were 39.6% and 28.3%, respectively [Figure 5]. Factor analysis was done to find the association between the various demographic data with the disease awareness. 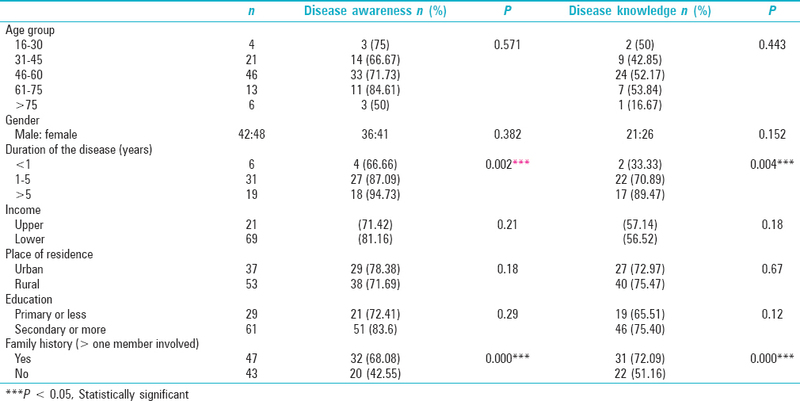 The disease awareness was not associated with the age, gender, literacy, or socioeconomic status of the subject [Table 2]. The participants who were diabetic for more than 5 years were more aware of the disease and treatment options available (P = 0.04). 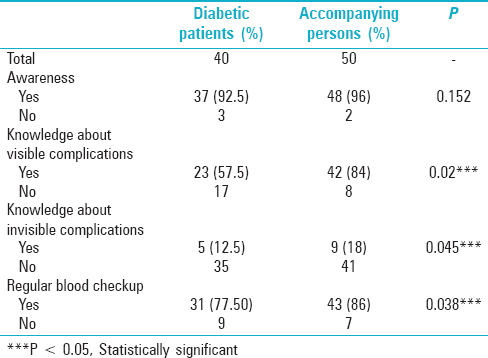 However, the knowledge regarding the visible and nonvisible complications of diabetes was more among the bystander group (P = 0.02) [Table 3]. Those with a family history had regular blood checkup, whether patient or bystander (P = 0.00). The challenges faced by the health care systems of the country in the control of diabetes and its sequelae are myriad. ,, Due to the chronic nature of diabetes, it is often difficult to ensure regular follow-up examinations of persons with diabetes and compliance to such repeated examinations. , The complications of diabetes are irreversible and costly to manage. The economic burden on the patients and their families force the people to neglect health care resulting in severe morbidities and early mortality. Till date, India lacks effective and comprehensive diabetes health care programs. The rising rate of affected individuals especially youngsters and their suboptimal diabetic control makes DM a silent, but imminent, public health problem. The scarcity of specialized centers with sophisticated infrastructure and equipment, well-trained staff and potent medications, especially in the rural areas is a major limitation in the effective treatment of diabetes. ,, In this context, patient education becomes a chief component in the prevention and control of this disease. This involves diet modification, increased physical exercise and lifestyle changes (weight control, cessation of smoking etc.). These educational programs should help people to assess their risks of diabetes; motivate them to seek proper treatment and care and regular self-referral to rule out microvascular and macrovascular complications of the disease. It should also help in prompt detection and treatment of complications with early referrals of cases to specialized centers for management and follow-up. , The need for establishing an effective information education system is determined by the prevalence of lack of awareness in the population regarding the disease and its long-term effects. Even among subjects and their accompanying persons attending a tertiary hospital for care of diabetes-related eye disease, the awareness about the disease entity was marginal. 38.70% of the study population knew what DM is, but only a minority knew about insulin depletion and resistance. Results of published studies from other countries vary in methodologies adopted and sampling frames and hence the comparison of awareness rates is often difficult. In global data, the awareness about the disease - DM is reported to differ between 40% and 93%. , Better awareness was related to better understanding of the disease in the majority of the reports. However, the percentage of people with knowledge about the pathogenesis of the disease constituted less than two-third of those with awareness. ,, Though the prevalence of subjects with the awareness regarding diabetes and its complications were different among high and low resource countries, the lack of proper knowledge among those who claimed to be aware was appreciable in all the major studies conducted in these countries [Table 4]. The low disease awareness among the population along with the asymptomatic nature of the disease is the major reason for delayed diagnosis of the diabetes-related morbidities. ,, Still poorer awareness about its complications and sequelae adds on to the problem. OHA and insulin were considered as the main treatment options for diabetes; one-third of subjects felt diabetes can be controlled by dietary modification and medications. A small percentage believed that dietary modification is the mainstream of diabetic management. Knowledge of how diabetes can be prevented was also poor. The knowledge about dietary modification was limited to avoidance of sugar and jaggery in a majority. Though almost half of our study participants knew about the need for exercise in diabetic control, only 12.08% exercised regularly. The chief source of information regarding DM was the attending physician. Though widespread coverage is provided by the mass media, their influence was not significant. Our observation differs from many of the community-based studies in literature, where the main source of information to the public was mass media followed by family and friends (Saikumar et al., Tajunisah et al.). , It shows that though mass media has an important influence on the population in disbursal of information regarding non-communicable diseases like diabetes, it is surpassed by the advice of the treating physician once the person or near relative is affected by the disease. This shows the importance of advice and interaction with the physician in creating awareness regarding DM. But even though, all the participants had first-hand exposure to the details of the disease process as evidenced by the frequency of physician visits and many more laboratory visits, the knowledge attained was partial and prejudiced. In spite of access to medical knowledge concerning prevention and treatment of diabetes, neither the subjects nor their bystanders had fully understood the disease and its comorbidities. Further, proper understanding of the medical advice and its implementation was poor among this peer group. The disease awareness was not associated with the age, gender or literacy or socioeconomic status of the subject. The participants who were diabetic for more than 5 years were more aware of the disease and treatment options available. The knowledge regarding the visible and nonvisible complications of diabetes was more among the bystander group. These relatives having accompanied their diabetic relations to the hospital or lab and assisted in their care or hospital admissions were probably more familiar with the symptoms and signs of diabetic microvascular and macrovascular complications. This is also evident in the fact that those with a family history had regular blood checkup, whether patient or bystander. Positive family history was noted as a good predicator by Aljoudi and Taha, Foma et al., Saikumar et al. and Lemes Dos Santos et al. ,,, It is well known that population screening is difficult to implement in India due to the large population. Moreover, existence of numerous alternative systems with contradictory medication regimes and suggestions is a major obstacle in the implementation of a standard practice care in DM in India. An opportunistic screening done by the health care providers, medical and paramedical, for subjects reporting for routine medical checkup or minor ailment is the viable alternative option. Identification of the accompanying personnel, who are more receptive to medical advice and its implementation and counseling them to become opportunistic screeners and evaluators of the disease, at least in their family and neighborhood, may be a feasible strategy worth trying in the control of this silent epidemic. Our observations are compared with that of the literature [Table 4]. Limited data, translational bias, bias in the understanding of the response by the interviewer and recall bias due to self-reporting are the limitations of this study. Though the sample size is less, this data can be considered as a representative sample of health seeking diabetic population with evidence of microvascular or macrovascular complications. The prevalence rates of diabetes are increasing rapidly in rural as well as urban India. Unlike other states, the rural prevalence rate is found to be equal to or more than the urban prevalence rate in Kerala. Mohan et al. remarks that this phenomenon is due to lack of clear urban/rural demarcation in Kerala due to the easy access to primary and specialized centers for diabetic care and management. Even among such a group of subjects with exposure to tertiary medical care, the disease awareness was noted to be poor and incomplete. Poor understanding about the disease process, ocular and nonocular complications, preventive and screening strategies were evident in our study. There is also a huge gap between attitudes, knowledge, and actual practice within the study population. Thus, it can be assumed that the knowledge about the disease will be worse among those without sequelae of diabetes as it reduces the requirement of visits to physician or laboratory for a frequent and regular checkup. This is also a reflection of the lack of awareness in the general population. Our study showed that the majority of patients attending the ophthalmology OPD of a tertiary care hospital has poor knowledge on several health-related aspects of DM. We observed that awareness of DM increased with duration of the disease. It was higher in participants with a family history of diabetes. Bystanders with exposure to diabetes and receptive to medical advice for self or family members had better understanding about the disease. They perhaps provide potential health workers or councilors in mass education programs. More educational campaigns are required for improving the level of awareness among subjects with and without diabetes, both within and outside the hospital as part of strategies to prevent, manage and control DM. Deepa M, Bhansali A, Anjana RM, Pradeepa R, Joshi SR, Joshi PP, et al. Knowledge and awareness of diabetes in urban and rural India: The Indian Council of Medical Research India Diabetes Study (Phase I): Indian Council of Medical Research India Diabetes 4. Indian J Endocrinol Metab 2014;18:379-85. Namperumalsamy P, Kim R, Kaliaperumal K, Sekar A, Karthika A, Nirmalan PK. A pilot study on awareness of diabetic retinopathy among non-medical persons in South India. The challenge for eye care programmes in the region. Community Eye Care 2004;52:247-51. Mohan D, Raj D, Shanthirani CS, Datta M, Unwin NC, Kapur A, et al. Awareness and knowledge of diabetes in Chennai - The Chennai Urban Rural Epidemiology Study [CURES-9]. J Assoc Physicians India 2005;53:283-7. Muecke JS, Newland HS, Ryan P, Ramsay E, Aung M, Myint S, et al. Awareness of diabetic eye disease among general practitioners and diabetic patients in Yangon, Myanmar. Clin Experiment Ophthalmol 2008;36:265-73. Engelgau MM, Geiss LS, Saaddine JB, Boyle JP, Benjamin SM, Gregg EW, et al. The evolving diabetes burden in the United States. Ann Intern Med 2004;140:945-50. Hu D, Fu P, Xie J, Chen CS, Yu D, Whelton PK, et al. Increasing prevalence and low awareness, treatment and control of diabetes mellitus among Chinese adults: The InterASIA study. Diabetes Res Clin Pract 2008;81:250-7. Wu YF, Xie GQ, Li Y, Zhao LC, Zhou BF. The current status on the prevalence, awareness, treatment and control of diabetes mellitus in several Chinese subpopulations. Chin J Epidemiol 2005;26:564-8. Yifeng L, Aiguo Y, Ying G, Junwei L, Weidong Z . Prevalence, awareness and treatment of type 2 diabetes mellitus in rural residents of Henan. J Med Forum 2008;29:23-5. Sims M, Diez Roux AV, Boykin S, Sarpong D, Gebreab SY, Wyatt SB, et al. The socioeconomic gradient of diabetes prevalence, awareness, treatment, and control among African Americans in the Jackson Heart Study. Ann Epidemiol 2011;21:892-8. Alkerwi A, Pagny S, Lair ML, Delagardelle C, Beissel J. Level of unawareness and management of diabetes, hypertension, and dyslipidemia among adults in Luxembourg: Findings from ORISCAV-LUX study. PLoS One 2011;8:1-7. Pei-An L, Peipei C, Jiaxi Y, Lei Z, Ning Z. A survey on the prevalence rate, awareness rate, treatment rate and control rate of diabetes mellitus in Xuzhou. Chin J Mod Nurs 2010;16:2371-4. Le C, Jun D, Zhankun S, Yichun L, Jie T. Socioeconomic differences in diabetes prevalence, awareness, and treatment in rural southwest China. Trop Med Int Health 2011;16:1070-6. Wang C, Yu Y, Zhang X, Li Y, Kou C, Li B, et al. Awareness, treatment, control of diabetes mellitus and the risk factors: Survey results from Northeast China. PLoS One 2014;9:e103594. Li MZ, Su L, Liang BY, Tan JJ, Chen Q, Long JX, et al. Trends in prevalence, awareness, treatment, and control of diabetes mellitus in mainland China from 1979 to 2012. Int J Endocrinol 2013;2013:753150. Chen R, Song Y, Hu Z, Brunner EJ. Predictors of diabetes in older people in Urban China. PLoS One 2010;7:1-11. Hipwell AE, Sturt J, Lindenmeyer A, Stratton I, Gadsby R, O′Hare P, et al. Attitudes, access and anguish: A qualitative interview study of staff and patients′ experiences of diabetic retinopathy screening. BMJ Open 2014;4:e005498. Lindenmeyer A, Sturt JA, Hipwell A, Stratton IM, Al-Athamneh N, Gadsby R, et al. Influence of primary care practices on patients′ uptake of diabetic retinopathy screening: A qualitative case study. Br J Gen Pract 2014;64:e484-92. Scanlon PH, Aldington SJ, Stratton IM. Epidemiological issues in diabetic retinopathy. Middle East Afr J Ophthalmol 2013;20:293-300. Scanlon PH, Carter SC, Foy C, Husband RF, Abbas J, Bachmann MO. Diabetic retinopathy and socioeconomic deprivation in Gloucestershire. J Med Screen 2008;15:118-21. Demaio AR, Otgontuya D, de Courten M, Bygbjerg IC, Enkhtuya P, Oyunbileg J, et al. Exploring knowledge, attitudes and practices related to diabetes in Mongolia: A national population-based survey. BMC Public Health 2013;13:236. Saikumar SJ, Giridhar A, Mahesh G, Elias A, Bhat S. Awareness about eye diseases among diabetics - A survey in South India. Community Eye Health 2005;18:97. Rani PK, Raman R, Subramani S, Perumal G, Kumaramanickavel G, Sharma T. Knowledge of diabetes and diabetic retinopathy among rural populations in India, and the influence of knowledge of diabetic retinopathy on attitude and practice. Rural Remote Health 2008;8:838. Tajunisah I, Wong P, Tan L, Rokiah P, Reddy S. Awareness of eye complications and prevalence of retinopathy in the first visit to eye clinic among type 2 diabetic patients. Int J Ophthalmol 2011;4:519-24. Foma MA, Saidu Y, Omoleke SA, Jafali J. Awareness of diabetes mellitus among diabetic patients in the Gambia: A strong case for health education and promotion. BMC Public Health 2013;13:1124. Cetin EN, Zencir M, Fenkçi S, Akin F, Yildirim C. Assessment of awareness of diabetic retinopathy and utilization of eye care services among Turkish diabetic patients. Prim Care Diabetes 2013;7:297-302. Lemes Dos Santos PF, Dos Santos PR, Ferrari GS, Fonseca GA, Ferrari CK. Knowledge of diabetes mellitus: Does gender make a difference? Osong Public Health Res Perspect 2014;5:199-203. Mumu SJ, Saleh F, Ara F, Haque MR, Ali L. Awareness regarding risk factors of type 2 diabetes among individuals attending a tertiary-care hospital in Bangladesh: A cross-sectional study. BMC Res Notes 2014;7:599. Memon MS, Shaikh SA, Shaikh AR, Fahim MF, N Mumtaz S, Ahmed N. An assessment of knowledge, attitude and practices (KAP) towards diabetes and diabetic retinopathy in a suburban town of Karachi. Pak J Med Sci 2015;31:183-8. Guo XH, Yuan L, Lou QQ, Shen L, Sun ZL, Zhao F, et al. A nationwide survey of diabetes education, self-management and glycemic control in patients with type 2 diabetes in China. Chin Med J (Engl) 2012;125:4175-80. Ulvi OS, Chaudhary RY, Ali T, Alvi RA, Khan MF, Khan M, et al. Investigating the awareness level about diabetes mellitus and associated factors in Tarlai (rural Islamabad). J Pak Med Assoc 2009;59:798-801. Rafique G, Azam SI, White F. Diabetes knowledge, beliefs and practices among people with diabetes attending a university hospital in Karachi, Pakistan. East Mediterr Health J 2006;12:590-8. Shah VN, Kamdar PK, Shah N. Assessing the knowledge, attitudes and practice of type 2 diabetes among patients of Saurashtra region, Gujarat. Int J Diabetes Dev Ctries 2009;29:118-22. Unadike BC, Chineye S. Knowledge, awareness, and impact of diabetes among adolescents in Uyo, Nigeria. Afr J Diabetes Med 2009;3:12-4. Muninarayana C, Balachandra G, Hiremath SG, Iyengar K, Anil NS. Prevalence and awareness regarding diabetes mellitus in rural Tamaka, Kolar. Int J Diabetes Dev Ctries 2010;30:18-21. Aljoudi AS, Taha AZ. 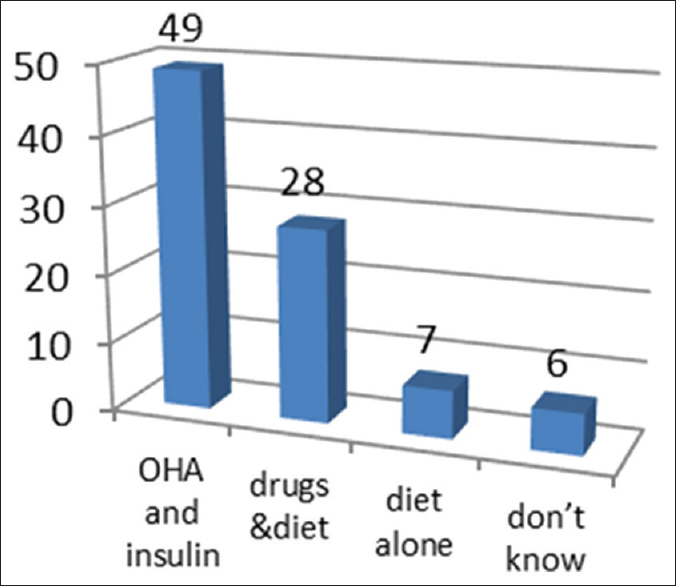 Knowledge of diabetes risk factors and preventive measures among attendees of a primary care center in Eastern Saudi Arabia. Ann Saudi Med 2009;29:15-9.